Since their invention in the late 13th century, eyeglasses have been the primary solution for vision correction. In the early 20th century, hard contact lenses were invented, giving people the opportunity to shed their glasses. However, it wasn’t until the 1960s that ophthalmologists made a breakthrough. By using water-absorbing plastic, a soft contact lens was developed, which was more comfortable to wear than its predecessors. The use of soft contact lenses exploded after they were introduced to the U.S. market in 1971. By the late 1970’s, a new technology was being developed that would usher in a whole new era of vision correction. The excimer laser could produce exact, clean cuts without thermal damage to surrounding structures, ideal for refractive eye surgery. Photo Refractive Keratectomy (PRK) was approved by Health Canada for treatment of myopia and astigmatism in 1990. About the same time, doctors in Greece and Italy combined the techniques of keratomileusis and PRK to create the basic concept of LASIK (which stands for “Laser Assisted In Situ Keratomileusis”). 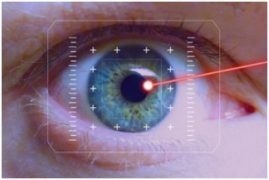 Decades later, we continue to refine these procedures, but LASIK and PRK are the staples of Laser Vision Correction. Other scientific advances include the surgical insertion of artificial lenses to correct eyesight, including Refractive Lens Exchange (RLE) and Intraocular Collamer Lens (ICL). Herzig Eye Institute has been providing these options since the mid 90′s. Our founding surgeon, Dr. Herzig is a world-renowned pioneer in refractive surgery dating back to 1989. This has enabled Herzig Eye Institute to be a world leader in refractive surgery providing new technology and innovations to patients from around the world. The thickness of the cornea and the surgeon’s interpretation of corneal topography and other measurements determine whether LASIK or PRK are more appropriate. A small number of people have refractive errors that are too large or eye conditions that are not appropriate for laser vision correction. In these situations, there are other treatments available. Refractive Lens Exchange (RLE) is used for patients with very high levels of nearsightedness or farsightedness, and for people who have early lens opacities. The Intraocular Collamer Lens (ICL) is available to patients who are at least 18 years of age, with high levels of myopia, hyperopia, or astigmatism that are too extreme for laser vision correction, and for whom laser vision correction on the cornea is not safe. lens of the eye loses part of its elasticity, and presbyopia, the loss of reading vision, begins to develop. Until recently, the only solutions to the loss of reading vision were reading glasses or bifocals, but the Herzig Eye Institute offers several other treatment innovations to correct presbyopia. Monovision means that one eye, usually the dominant eye, is corrected for distance vision and the non-dominant eye is corrected for reading. Surgically, monovision can be achieved with one of Herzig Eye Institute’s High Definition Vision® solutions (LASIK, PRK, RLE or ICL). In almost all patients, there is no awareness that the eyes are different, making this a very successful approach. The Herzig Eye Institute also provides the most recent technological advancements for Advanced Refractive Cataract Surgery, allowing patients to regain their full range of vision, including reading vision, by using multifocal and extended range intraocular lenses. Most other facilities don’t offer more than one option. However, when you come to the Herzig Eye Institute, you can take comfort in knowing that our surgeons are not limited by a single procedure. Their goal is to customize a treatment that will give you the best result possible.